Soft skills are an event planner’s best friend. For those who haven’t heard this term, “soft skills” refers to your non-tangible, non-quantifiable skills – things like your personality, etiquette, how you get along with others, small talk and listening skills. An event planner’s profession requires both soft and hard skills but this article focuses more on soft skills. You need to have a friendly personality that speaks to people and gives the impression that you are casual and friendly, yet are very capable to make their best day special. We are going to elaborate on that thought and speak about the other attributes that will help you succeed. You should be someone that people consider as friendly and affable. This is displayed as soon as you walk into a meeting based on your smile, body posture and attire. Make sure you have researched your client and dress casually or formally based on what you think your client is looking for and the type of event. No matter what be sure to smile, give a firm handshake and listen to every little detail including things like your potential client’s family situation, children, etc so you can ask the client about these things later. People are always impressed if you remember their kids birthday or wife / husband’s event. Make sure you write down all these details as soon as your meeting is over so you can remember them to bring up during small talk in the future. You absolutely always want to listen more than you talk around your clients. A good rule of thumb is to have your client talk twice as much as you. This way you’ll surely take in and learn everything they want in their event, and it makes others feel better when they are listened to. Afterall, any event you do is supposed to make your clients feel special. It’s their day. When someone is considering you to plan the an important event of their life or company, they would need you to understand their ideas, and not impose your ideas on them prior to knowing what they want. This can only happen if you hear them out fully first. Of course you need to ask questions and find out what exactly that they are looking for but you only learn that by listening. Once you know all the details, you can start making suggestions. Your suggestions should be professional and should be accompanied by your experience and knowledge of the field, but you should never try to drastically change what your clients are looking for. Be sure to include examples, stories and case studies to back up some of your ideas so put your clients at ease. Everyone who plans an event has a budget. They will tell you the budget in advance (either in person or on your client questionnaire), and even if they don’t tell you, you have to ask them about it. Once you know the budget, it’s your responsibility to get them the best value for their money’s worth. They should feel that it is money well-spent. They should feel that you are on their team budget-wise and are doing everything you can to stick within their constraints. If you have a particular city you plan most of your events in, you should have venues and vendors for all types of budgets ready to go in mind. This way, once you learn your client’s budget you can quickly narrow down options to make the event as good as possible. An event planner’s biggest responsibility is making sure the event goes off without a hitch. It is not just about the cake, food and drinks, but it is also about the venue and the decor. You have organize the entire place in the manner that has been communicated to you by your client. The event might even be taking place in a temporary tent structure, and if that is the case you have to see that everything is brought in to look beautiful and serve the purpose of the event. You might need to bring in non-traditional vendors like electricians, drivers, valet, etc. to make sure things go smoothly. All vendors should be ready to perform their duties in a properly synchronized manner and you have to be the one who stays most organized. During most events, there is a lot of frenzied action behind the scenes. The hours before an event starts is almost always pandemonium (at least backstage). You can prevent a lot of that by being organized, well prepared and communicative in the weeks leading up to the event. Keep in mind that even if you have done everything in the most organized way possible, some things will be out of your control. Like the bridal car getting delayed in traffic, or the weather unexpectedly raining. There is nothing you can do about those things. At times like this an event planner must put a brave face on and not be hypersensitive about things they cannot control. It requires a great deal of emotional courage to stay strong when others are flipping out and that is the job of the event planner. Your clients will look to you for strength during unexpected set-backs and thank you after the event is over. These are the times you really provide value on top of all your planning. 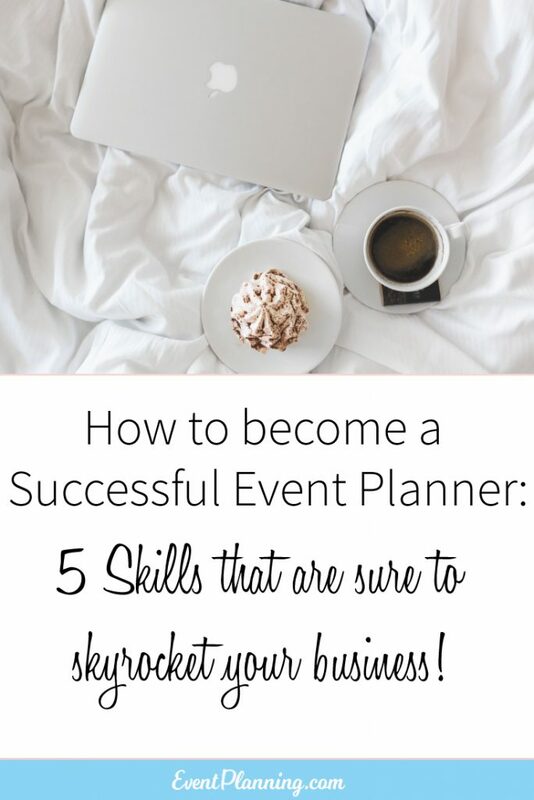 These are just a few of the things you need to be on the top of as an event planner. We will cover the hard skills that help you succeed in another article. I love that term: soft skills. And how true. I was fortunate to have taken a management course with Disney a few years back. And what sticks with me the most to this day is its hiring philosophy: you can teach technical skills but can’t teach personality. I want to be a party planer , before opening the office I want to know about this business in details each and every thing please help me.